1. Your bike gets stolen. Oh no! 2. You file a theft report, and let us know about your stolen bike. 3. We receive your report. After reviewing it, we will post it on the main page. We mainly review reports to weed out spam and make minor editorial corrections to formatting. 4. Your theft report, including your bike's photo, last known location, and date of theft, are posted on our site. Your report also goes into our searchable statistics builder and is shown on our report map. And, if you're lucky, someone might see your bike and contact you directly and return your bike. Time is of the essence! Please post your report ASAP for the best chance of getting your bike back, even if you don't yet have all the information. You can contact us via email at csbr@mailworks.org at any time to add to or change your listing. Important: See Mr Bike's tips on I.D.-ing your bike before it gets stolen! Search tip: Be aware indexing happens nightly so it's recommended that you eyeball at least the first 10 or 12 listings in addition to using the "search" feature. Feel free to browse recovered bike listings for inspiring tales of bike/owner reunions. The old Stolen Bike Registry (Jan 2005-Aug 2006) is still available here. Brand new. It has a white sticker on it for 300 East Randolph. I think number 0200 (or similar, that could be wrong). It has an ABUS U-lock with lime green top. Make: Salsa Cycles, Model: Journeyman, Description: Lightweight roadbike in like-new condition. Body of bike is white and says "salsa" on the downtube (diagonal bar), there is a small grey image of a pepper on the head tube on the front of the bike (the pepper is not a decal, but rather an image on the body of the bike), black dropbar handlebars, with brakes on the handlebars, levers on the handles adjust gears, two water-bottle holders fixed on the downtube. Black quick-release tires, (which were locked to prevent theft/being able to be removed from the bike at time it was stolen). Thin black seat, says "WTB" in small letters on side of the seat. Tires are a sort of "hybrid", thicker than thin road-bike tires, but thinner than mountain tires. Bike was locked to a bike rack with a U-lock and cable through the wheels, in front of 231 S. LaSalle Street, corner of W. Jackson Blvd. (right in front of Chicago Board of Trade building). Bike was locked to a bike rack with a U-lock and cable lock through both tires. The quick release tires were locked and can only be removed from bike w/a key (which I have). Bike rack is in front of 231 S. LaSalle St. corner with Jackson Blvd. Bike was locked at 8:45AM, and when I returned to the bike rack to retrieve the bike at 6:45PM, it was gone, along with the U-lock and cable lock. Nothing left behind. I took a picture of the rack at time I realized it was missing. Brand new!!! Took home from Trek store Monday. Stolen Wednesday. Had added brand new allen black Brontrager Front and Rear Fenders and bike rack installed. Had added my old rear bike light mount. Came with Bontrager cellphone mount on handlebar. Locked frame to bile rack in front of Lyric Opera House (Madison/20 N. Upper Wacker Drive). Bike had Kryptonite SE locking skewers on front and back wheels. Lock was Brand new Bontrager Elite Keyes Folding Lock. Went inside at 12:53pm found stolen at 2:05pm same day. Unique color combination with bronze (copper-colored) fenders. Built-in cupholder in frame. Built-in rack with bronze/copper straps. Bike stolen from office building bike room. Parked in front of Starbucks and LVAC gym on Diversey, parked at 11:10 and returned at 1:20pm to find bike missing. Great condition, with some minor scratches in the paint, but looks mostly new. Black metal basket in the front, blue/red/yellow children's bicycle bell on front handle bars (sentimental, was my little brother's bell from his first bike), cell-phone pouch on front handlebars, side mirror on left handle, Blitzu headlight in front, bottle rack on middle diagonal frame bar beneath seat, two rear brake lights, blue LED lights in both wheels, has my name/email address on a sticker on the front handle bars, a sticker reading "4074" on front handlebar joint, and a garage parking sticker on the side of the frame. I arrived at work at about 9:40am, with my GoPro recording. I locked my bike to the bike rack by running the combination cable through the frame and the front wheel. The rack my bike was secured to was a very sturdy city-owned black bike rack (not a "sucker-pole"), the kind that is a single metal frame secured pretty deep into the sidewalk pavement. (Shaped like a big staple.) At 6:00pm, I came out to find my bike missing, and a different bike in its place. The security footage shows that at 3:35pm, a black male wearing a red hat, grey loose-fitting pants, dark-colored jacket, black & white shoes, and a backpack, casing the bike rack area, inspecting it, shaking the bike a bit, then using a screwdriver to remove the cable lock quickly, and rode away on the bike southbound on Wacker. Security is watching vigilantly from now on. Condition: New Distinguishing features: Euromini website printed on wheel spokes, Kryptonite lock mount attached to bike below the saddle. Bike locked to bike rack with a kryptonite U-lock through wheel stolen from corner of E Grand Ave and N State street. Incident happened between the hours of 12:00pm-5:10pm. U-Lock was left locked to the bike rack. Robber broke into apartment and attempted to break into my unit using crowbar or screw driver. Bike was unlocked in storage area I went to the unit door and saw thief through the peep hole. I yelled and he ran down the hallway grabbed bike and ran out the back door. Brand new Liv Alight, charcoal gray. I had it for less than two weeks, and I hadn't had a chance to register it with the police yet. Bike was inside a locked garage, but my husband came home to find the garage door open and the bike missing. Blue pedals, water bottle holder, lock holder, lots of stickers (DePaul U, Three Ships Roasters, Chic's Diner, "ELK"). Was stolen from the bike rack on north west corner of Monroe and Columbus Drive, near the Art Institute. Parked two bikes on the north west corner of Columbus and Monroe at the bike rack, went to see the Bean and have brunch at The Gage, came back and one of the two bikes was gone, along with the lock, and the helmet (which was also locked up). Good but ridden condition. It’s neon orange with motobecane in silver letters. Purple front wheel, neon green fixed gear back wheel, neon green pedals with pink hold fast straps. Tan brooks saddle and purple bull horn handle bars. The bike was not locked, but it was in a locked area behind North Pond in Lincoln Park. It was stolen while I was working. Brand new Trek FX3 2019 in Viper Red. The bike was locked at the bike rack in front of University Hall at UIC close to the Behavioral Sciences building. Was stolen probably at some time after 5 after campus traffic died down. 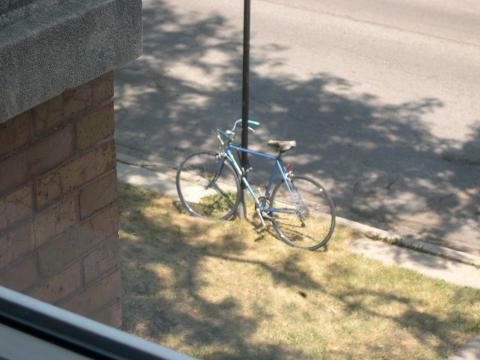 the bike was stolen through the back door of an apartment building located at 1133 W Taylor street. The bike was located on the fourth-floor stairwell. the thief trespassed the building and climbed four flights of stairs.